Forced displacement and evictions in Africa is largely due to conflict, natural disasters, human rights violations or Political instability. As a result of forced evictions, people are often left homeless and destitute without means of earning a livelihood and in practice, with no effective access to legal redress or other remedies. Forced evictions intensify inequality, social conflict, and segregation and invariably affect the poorest, socially and economically vulnerable and marginalized sectors of society, especially women, children, minorities and indigenous people. In this regards GROOTS Kenya attended #GIMAC33 that was held on 3rd-4th February 2019 in Addis Ababa Ethiopia under the theme: Towards Gender-Responsive Durable Solutions to Forced Displacement. The meeting aimed to identify strategies and interventions that have continental implications to effectively address forced migration in a manner that includes and benefits women and girls. 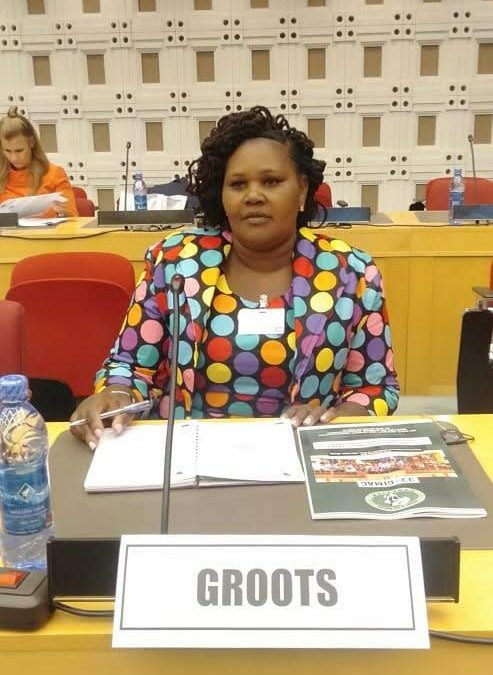 GROOTS Kenya has been and continue to work with women and girls IDPS in Laikipia and Nakuru counties to identify lasting solution such as small scale farming and school attendance . Women and girls who are forcibly displaced by conflict, natural disasters, economic reasons or other causes, face specific threats and diverse forms of gender-based discrimination, violence and human rights violations. Their access to legal protection, safety, gender responsive assistance, a life of dignity and respect for their rights is often further undermined by factors such as age, disability, previous marginalized social position among others.